If you started searching for FIP (Feline Infectious Peritonitis) on the Internet and stumbled upon this page, I am really sorry for you. Perhaps your or your family’s cat (or a friend’s, or a relative’s cat) is diagnosed with the disease. I know how do you feel, now you are really sorry, your heart is broken, you feel empty and helpless, and you are searching for a possible cure for this horrible disease. I can understand your feelings because I recently lost my beloved “Sarman” to FIP. And now I am devastated. FIP is a fatal disease that affects cats. It is caused by a mutation of feline enteric coronavirus (FECV) or simply Feline coronavirus (FCoV). Coronavirus is highly contagious and common but in fact not harmful itself. Most infected cats do not develop FIP. But, in some rare cases, the Feline Coronavirus mutates into Feline Infectious Peritonitis virus (FIPV) – and… it is hard to say that because I know how it hurts, but, there is no known cure for FIP and very, very few survivors of the disease. I recently lost my beloved “Sarman” to FIP. This photo was taken on September 13, 2017, nine days before his death. When the Feline coronavirus mutates into FIPV, the cat’s immune system produces antibodies that are supposed to protect the cat. With the “assistance” of these antibodies, white blood cells get infected with the virus, and these cells then transport the virus throughout the cat’s body – then an intense inflammatory reaction occurs around vessels in the tissues where these infected cells locate, often in the abdomen, kidney, or brain. Despite the name of the disease contains “Infectious”, actually it is not highly contagious at all. Coronavirus is highly infectious. Diagnosing FIP is challenging. Despite the claims made by some laboratories and test manufacturers, there is currently no test that can distinguish between the harmless intestinal coronavirus and the deadly FIP coronavirus. A positive test may support the veterinarian’s suspicions, but by itself is inconclusive. It means only that a cat has been exposed to and may be harboring a coronavirus. A negative test usually (but not always) indicates that the cat is unlikely to have FIP. The earliest signs are the lack of appetite, fewer, weakness, weight loss, jaundice, and diarrhea. Another early sign that I noticed: my lovely boy, Sarman, started lying down on warm places like working PC cases or laptops on his belly. 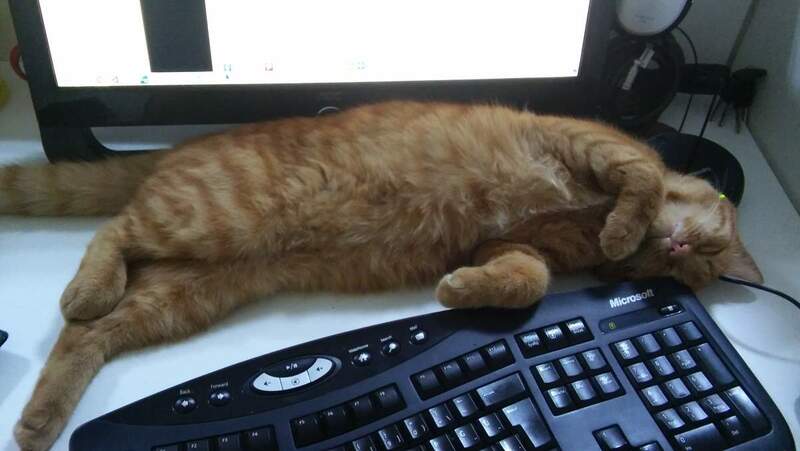 Before he got ill, he usually slept in funny and very cute positions – but suddenly he started to look for this kind of warm places to rest, and lying down on them on his belly. A very, very bad symptom which is an indicator that something was really wrong. He also started eating less and less every day. He stopped playing, even started not paying attention whatever goes around him at all. A few days later, he stopped cleaning (licking) himself. It’s like a switch – something in my lovely boy just switched off. There are two types of FIP: Effusive (wet) and non-effusive (dry). In fact, both types are fatal, but the effusive form is more common (60-70% of all cases are wet) and progresses more rapidly than the non-effusive form. It is also far more deadly. Almost all of the survivors (of which there are very few) developed the dry form. Unfortunately, again, Sarman has developed the wet form. The hallmark clinical sign of effusive FIP is the accumulation of fluid within the abdomen or chest. I first noticed his lack of appetite and weakness on August 21. In the early September, liquid started accumulating in his belly. This accumulated liquid squeeze the lungs, cause breathing difficulties and make the cat’s life even worse. Dry FIP will also present the same signs (i.e. lack of appetite, fever, weakness, weight loss) but there will not be an accumulation of fluid. Typically a cat with dry FIP will show ocular or neurological signs. For example, the cat may develop difficulty in standing up or walking, becoming functionally paralyzed over time. Loss of vision is another possible outcome of the disease. Unfortunately, there’s no cure for FIP. Treatment is symptomatic and palliative only. What only you can do is making the cat as comfortable as possible. Effusive FIP (wet form) usually progresses too rapidly, as in my Sarman’s case, for any meaningful therapy to be attempted. In the effusive or wet form, not very much. Perhaps days, or a few weeks. My lovely boy was gone one month after I noticed the first signs of this horrible disease. In the dry form, the life expectancy is higher. I know a cat who diagnosed with dry FIP in January 2016 and as of September 2017, she was still alive. Update: as of August 2018, she is still well and alive. But I am suspecting if she was really FIP at all. I think it might be a false positive. First of all, there is no single laboratory test available that can point decisively to FIP. But there are tests like ELISA or IFA to detect if your cat has been in contact with the virus and has developed antibodies to it. If the result of the test is negative, then you are lucky – your cat(s) never contacted with the virus. But, in the future, if you decide to take a new cat, before introducing it to your house cats, take it to your veterinarian and make sure that s/he is also corona negative. If it is corona positive, I would not recommend taking her/him. Because, in any cat infected with FECV (feline coronavirus), there is a chance that the virus may mutate into the FIP-causing form FIPV. In short, protecting your cat(s) from coronavirus infection dramatically decreases the likelihood of cats developing FIP. You should keep litter box(es) clean and locate them away from food and water. Clean feces from the litter daily and disinfect the box(es) regularly – maybe once a week. Preventing overcrowding, keeping cats current on vaccinations, and providing proper nutrition can also help decrease the occurrence of FIP in groups of cats. The hard truth again: FIP is incurable. All you can do is making the cat as comfortable as possible, as explained above. And please try to be with her/him as much as possible. You’ll probably be regretful if you don’t do so. It depends on the situation. If other cat(s) around are Corona positive, no quarantine needed. As explained above, coronavirus is infectious, not FIP. The coronavirus must undergo a mutation in order to lead to FIP. But if other cat(s) are corona negative, yes, you should quarantine the sick cat. You don’t want to make your other cat(s) corona positive. Once a cat is infected with the coronavirus, there will always be a chance (5 to 10 percent, most sources say) that the virus to mutate and the infected cat to develop FIP. An experimental polyprenyl immunostimulant is being manufactured by Sass and Sass in Tennessee, United States. It is classed as a biologic by the USDA. According to the Sass and Sass website they are conducting research on its use for FIP and other diseases of companion animals. Although not currently approved for the treatment of FIP by the USDA, it is being widely used off-label for prolonging the life of cats with milder forms of FIP. I would recommend you to read the whole article, and make your own decision to use it or not. I do not live in the United States, and there was no chance to find the stimulant where I live in (Istanbul). In fact, Sarman’s health condition deteriorated very rapidly. There was just not enough time… Even there was enough time, after reading the article on Davis’ website, I am really skeptical about that stimulant. There is only one licensed FIP vaccine available; however, this vaccine has minimal if any effect in preventing FIP, and it is not generally recommended by the American Association of Feline Practitioners Feline Vaccine Advisory Panel. Primucell FIP, produced by Pfizer Animal Health, is a temperature-sensitive, modified-live virus vaccine that is given as an intranasal vaccine and is licensed for use in cats at least 16 weeks of age. Core, means all cats should receive the vaccine. Not generally recommended, means have little or no indication. The FIP vaccine has been included in this third category. Being in the “not generally recommended” category does not mean the vaccine is bad or dangerous, it simply means that widespread use is not generally recommended among pet cats. If the FIP vaccine is used, antibody testing before vaccination is advised, since cats that have already been exposed and have antibodies don’t benefit from vaccination. So, the vaccine appears to be safe, but the risks and benefits of vaccination should be weighed carefully. You should consult your veterinarian to help you decide if your cat(s) should be vaccinated. 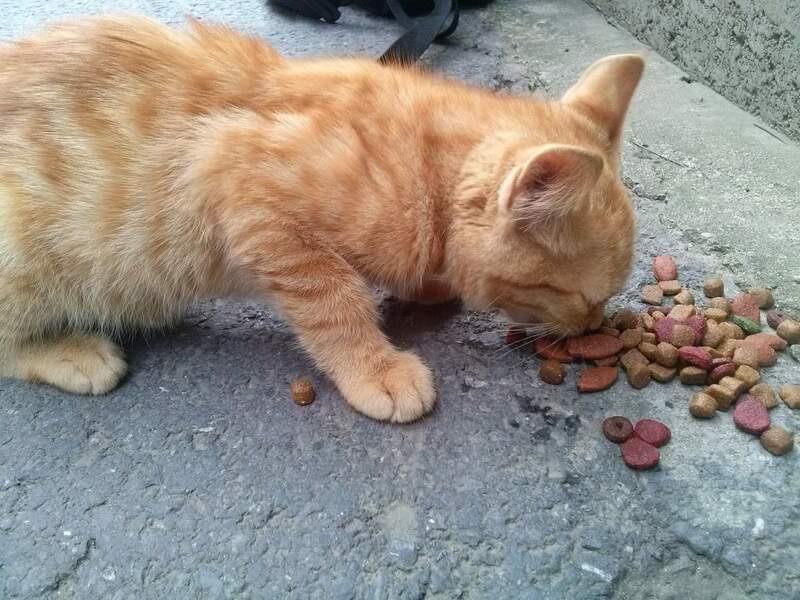 In August 2016, at the North campus of the Bosphorus University, Istanbul (where I work in), I saw a cute, little orange kitten. He was so tiny, so vulnerable. But he was also very timid, scared of everything and everybody – dogs, other cats, people, even me. When I try to give some food to him, he was running away. He was only eating the food after I walked away a bit. Sometimes I was waiting for a certain distance to enable him to eat his food. Because dogs were around. One morning, while I was walking fast, I noticed that something, something little, was clinging to my leg. I looked down – it was him! The cute little kitten was so hungry that his hungriness has overcome his fear. And he recognized me and decided to beg for some food. It was a very emotional moment for me. I gave him some food, he started scoffing. He was adorable! After he finished eating, I took him to my office. The first day with Sarman, August 16, 2016. He had a problem in his eyes – which I treated in a few days. The first day at the office (August 16, 2016). 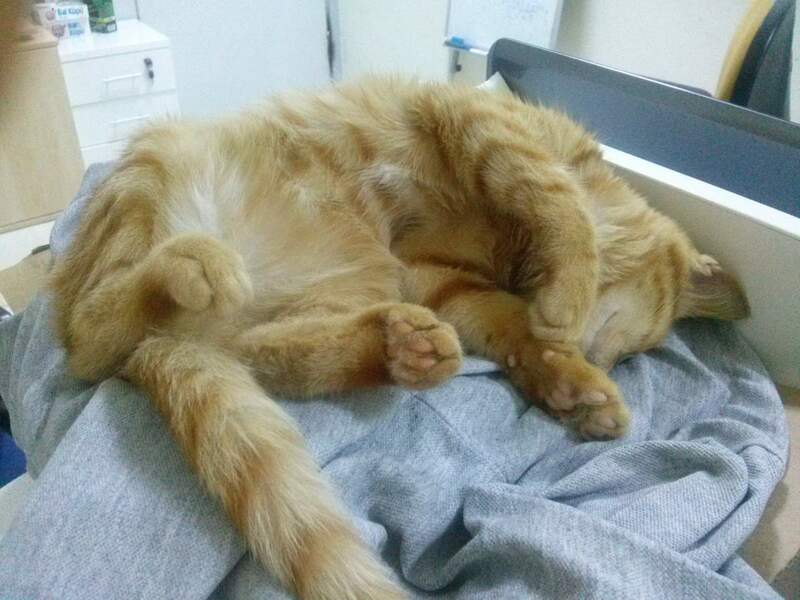 He’d already started sleeping in the cutest positions. After that day, he never left my side. He went wherever I go in the campus. He was waiting for me at our office door every morning, and after eating his food, he was sleeping by my side. Sometimes on my desk, sometimes on my lap. 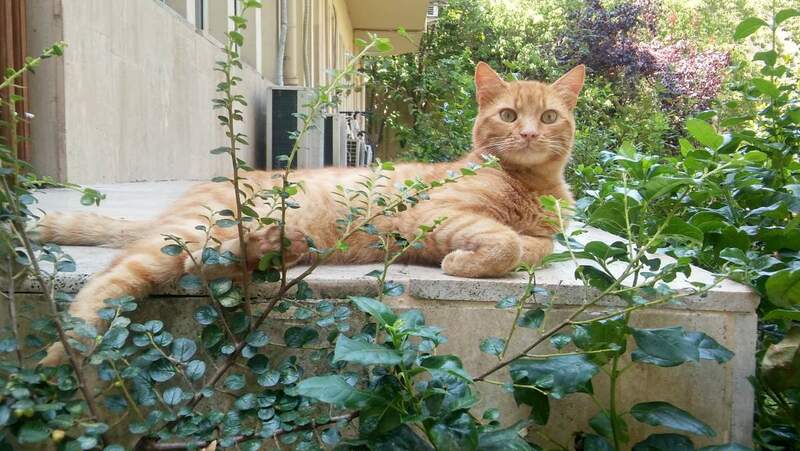 Sarman the orange cat, August 22, 2016. His eyes were much better after the treatment. In the video below, I am playing with my lovely boy. It was September 16, 2016. I didn’t know I’d lost him almost a year later. October 20, 2016. Playing with my little boy. I really miss his beautiful eyes. December 7, 2016. My lovely Sarman is sleeping on my desk. He was already looking like a grown-up cat. December 16, 2016. 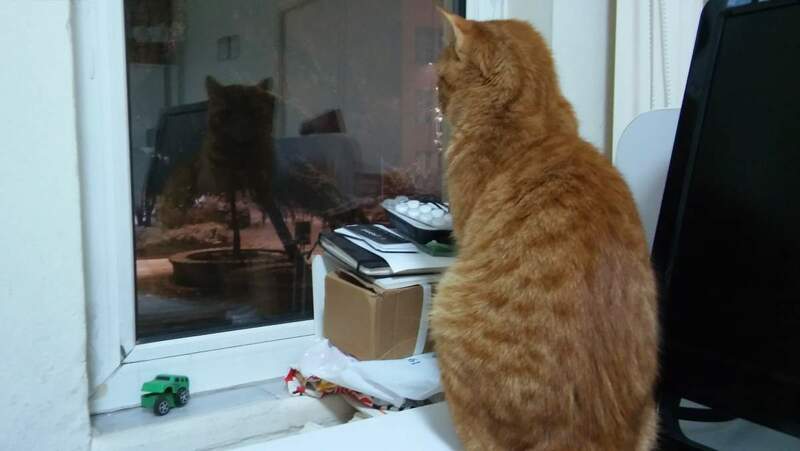 Sarman is watching the first snow of the year at my office. He also had friends. The video below was shot in last winter. The calico cat, who is licking Sarman is Korsan (meaning “pirate”, because she is missing one of her eyes). Sarman was the gentlest cat I ever saw. He was always kind to humans and to other cats. June 15, 2017. Summer is about to begin. Sarman is enjoying the warm weather. In the summer of 2017, the FIP has shown its ugly head in our campus (North campus of the Bosphorus University). We lost many cats (mostly kittens, but also a mother cat, her babies were already dead). I feared that my lovely boy would get sick, so I decided to take him home. It was a hard decision because I already have 4 cats at home, and they don’t like the newcomers. Anyway, I took Sarman to the vet for tests. Unfortunately, he was corona positive. My fur babies at home were negative. So I didn’t take the risk. Unfortunately, on August 21, 2017, I realized something wrong with him. He was less active, eating less. First I thought it was temporary. But, on August 26, I decided to take him to vet. They first said that it was bacterial. I was hopeful. But, his condition was getting worse and worse. On September 5, the veterinary said that he’d developed FIP. Wet form. Terminal. Nothing could be done anymore. I took him back to the university on the same day. Because there was nothing the vet can do anymore. I wanted him by my side, in his last days. I wanted him to see the sky, the sun, the trees for a few days more. The last healthy photo of Sarman. Taken on August 11, 2017. Just in ten days, he’d get terminally ill. He spent his last days in the neighborhood that he loved. Unfortunately, his condition got worse and worse. His belly started getting bigger and bigger. He stopped eating completely. I was feeding him with a syringe. But he was getting skinnier and skinnier. It was really hurting to see him like that. This photo was taken on September 21 at around 20:00. It was his last photo. In a few hours, he would be dead. We left him at the vet and I returned home at 1:00 am. At 1:30, the vet called me. My baby was gone. Forever. I started crying. I am reading this in tears. I rescued my sweet Duct Tape from a local shelter a month ago. I (and the shelter) assumed he was a layed back chill kinda cat. Within days of bringing him home he started eating less and less. The vet first treated him with antibiotics and steroids because he discovered a fractured tooth. My sweet boy continued to become weaker and weaker, eating very little and getting so thin, yet his stomache was so swollen. He passed away just a few days ago. My heart hurts so bad. Even after a few weeks, I miss the little guy so. Thank you so much for writing this, I started sobbing at your words. My mother recently passed away, and I felt getting a new kitten would help heal my heart. His name is Reboot, as a gesture towards life starting over and trying to reset after my loss. This morning I got a call from my vet to tell me Reboot, now 15 weeks old and weighing only 3.5 pounds, likely has FIP. We will go in for an ultrasound and fluid withdrawal to further test, but based on previous lab work, two neurological events, and his lack of interest in playing or eating, all signs point to FIP. I am devastated, and feel utterly helpless. I’m sorry you had to go through this yourself, but wanted to let you know that your writing helps me feel less alone. Thank you. Almost a year passed since I lost Sarman and it still hurts. I really know how do you feel. I can’t say much, I hope he can hold on to life. Whatever happens, thank you for taking care of him. They all deserve the best. I am sure he knows how much do you love him. You wrote a beautiful story about a horrible disease. My beloved Rosemary has just been diagnosed, and your story did give me some comfort. Most of all, I am so happy you gave Sarman a home, good food, and so much love. One of my favorite things about Istanbul is the cats, and how people take care of them; thank you. Really sorry to hear that… I hope she lives as long as possible and as comfortable as possible. Thank you for caring for her. We lost our little guy Buster yesterday, 5 and a half months old. Only 5 days passed from diagnosis until I found him gone after work on the 14th. We’re all heartbroken, but none worse than my 10 year old, he was hers, and she was his. I am really sorry to hear that, Aloysius. I’m so sorry to hear about Sarman. Mine and my fiance’s sweet cat nambed Furbelle suffered the same fate. She was a small cat that only weighed 5lbs at two years of age. If me or my fiance(Michael) ever had to go to the store or anything she works get so upset. She would set in her window seat and wait for us to come up in the front of the apartment and then she won’t start meowing. Furbelle would wait patiently for us to put our things down so we could have our special furbelle lovings. In November of 2017 my fiance was diagnosed with cancer and passed away six months later in May 2018. Sweet little Furbelle mourned his passing and it was so heartbreaking to watch her mourn and to know I couldn’t make it better for her. Then unfortunately sweet Furbelle was diagnosed with FIP and passed away. Furbelle passed away 3 months to the day of my fiance(Michael’s) passing. My sweet little baby Furbelle was only two yrs. old but in that two years she gave me more love than I could have ever imagined and just as much happiness. I hope and pray for the day to come that a cure will be found for this terrible disease. I’m so sorry to read your story. My little Victor was just diagnosed today. He is still eating but very thin and his abdomen is very distended. It is so heartbreaking. He is only 8 months old. Really sorry to hear that. Yes, it is so heartbreaking. Thank you for writing about Sarman. It is really helpful information. Heartbreaking but helps to read about your little kitty. My Victor literally fell off my roof along with another kitten into my life. Logan, the other kitten is thriving. They were born on our roof from a stray mama. I guess we should consider ourselves lucky for the time we have with these little guys. I hope Logan lives a long and healthy life. Really sorry for Victor. But I am sure he knows that you love him. My cat has had a fever now for almost two weeks…no antibiotic will bring it down. A total sign of FIP. He tested positive for it. My Dr. And I feel his age doesn’t fit the criteria as he is 7 but has all the symptoms. He had an x-ray done…no fluid visible so it very well might be the dry form. He is such a lover.. In good spirits…totally alert and wants to be normal. He has been hospitalized for the last week. Appetite not as good…lethargic…mild diarrhea… And that fever just won’t break…104.4 to 105 range. My heart breaks. I cry daily. He wants to be normal and tries but this fever won’t let go. I have so much money invested into him. If he didn’t show the will to live I would have put him down as per the suggestion of my last vet…but his will keeps me hopeful. I have spent almost 1 hour out of my day….generally my lunch hour at the vets to be alone with him. Feed him…groom him…pet him…talk to him…just to let him know I’m there for him. So sorry… I know how do you feel. I am sure he understands how do you love him and he appreciates what you’ve done for him. I hope a miracle happens and he clings to life. I truly hope he knew how much i loved him. I was at the vets office on his last day or hours before he passed. He was in such bad shape. Falling down on all 4 legs and he wasnt really alert towards me. He was so cold to the touch which his temp was down to 98 degrees after suffering from a month long high fever. I knew the end was there but he showed no signs of ever suffering. His gums looked horrible and his skin had a yellow tinge. 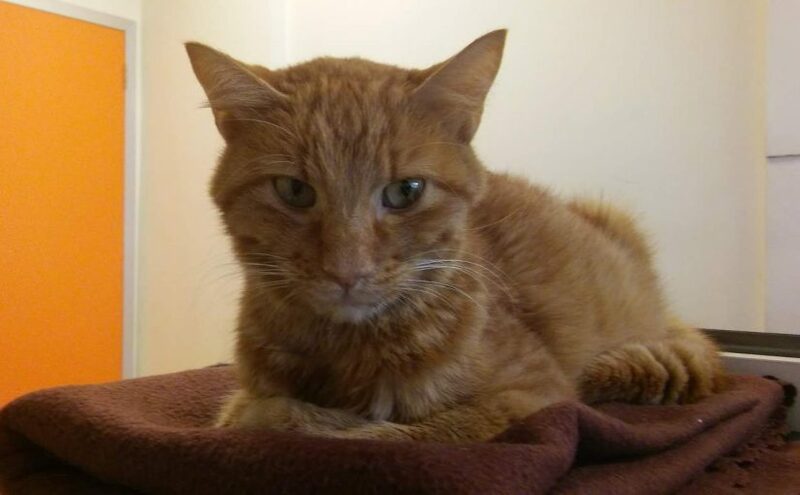 Crazy part was 2 days prior the clinic said he snapped out of the fever and was at normal temp…running around the clinic as best as he could greeting people and being inquisitive towards other cats and he ate a whole can of food. Two days later he took a turn for the worst and that was the end. My heart is soooo broken… i feel like the pain will never go away. If there’s no fluid in his belly, don’t lose your hope. There was a little fluid in his belly. Unfortunately Dec 2nd the vet tech went in early A.M. to go feed all the animals and he passed. It was confirmed by the pathologist/necropsy report they felt he did have FIP. Im so sad for him. He was such an easy going sweet loving cat that never caused any trouble. He did not deserve to be consumed by this horrible sickness. I’m going through the pain of the Wet version of this with my little buddy Thomas, a 7 year-old gray Tabby. All the symptoms listed here are present in him. He’s spending his last night on my lap sleeping, just as he always does. Tomorrow he goes to my vet where I will be forced to put the little guy to sleep so he doesn’t suffer. These little farts really grab your heart. Each with their own unique and fun personality. I’m very sorry for your loss and completely understand what you and everyone else posting here went through. 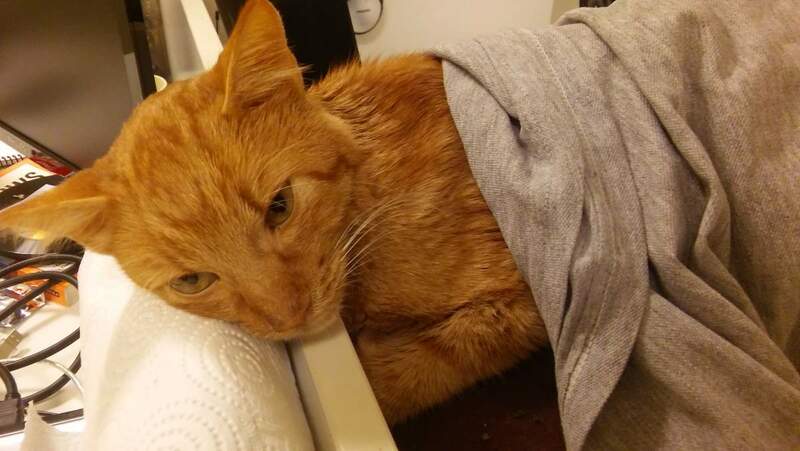 I find much comfort however knowing that because of you and others who took the time to post their experiences here on the Internet, tomorrow I will be making the right choice, and the only choice for my little buddy to save him from further suffering. Thank to you, Sarman’s owner and everyone else for sharing your kitty stories, May you all find peace in that you were amazing people who did all that could be expected of a pet owner to take care of their little ones. Really sorry to hear that. I am sure Thomas knew how you loved him. Yours is the best decision, putting him down so he won’t suffer anymore. My heart breaks for you today Mike! Truly. It was a very rough road for me. I can’t tell you how many times I called the vet in an “emergency” situation that we needed to meet to put Birkie down. I’d make the appointment and then getting ready to take him in he would be curled in a cute little ball or suddenly he would be walking ok again. When he had a good day… I was so happy and full of energy. When he had a down day it was very hard for me to function. My life was a rollercoaster since Oct 12th when it began and even though he passed on Dec 2nd I’m still coping with much anxiety and sadness. Some days are harder than others. Yesterday I got his remains back. The clinic I adopted him from actually wanted to pay for his cremation for me and they paid for his care expense until the end (I spent soooo much on him). They didn’t have to do that. I will be forever grateful to them. My husband doesn’t understand my loss and void I’m feeling and at times he’s very angry with me that I can’t move on. I’ve had pets my entire life but this one hit me the hardest. 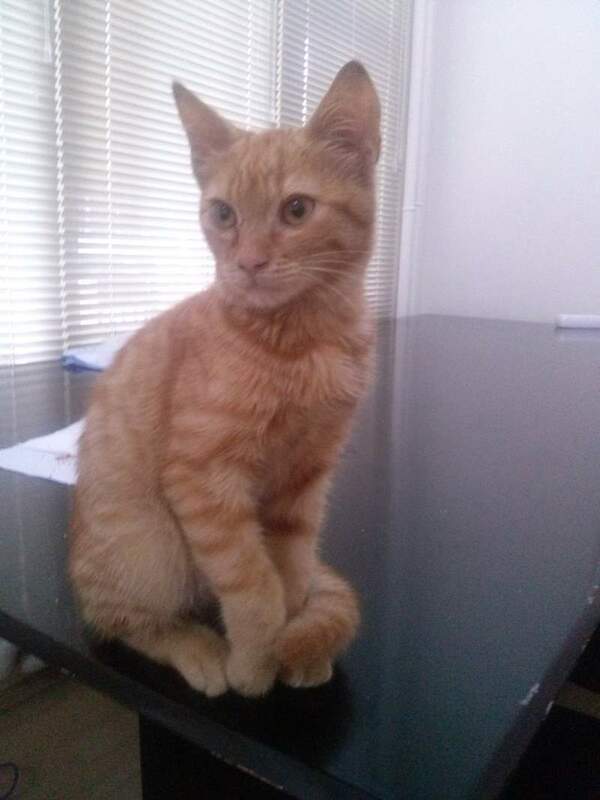 Right now I am fostering a 6 month old kitten to adopt. This one is the same age as when I adopted Birkie. Although this kitten is lifting my spirits, providing me with therapy and making me laugh and in return I’m givig him a good home, providing him with human affection and teaching him good socializing skills… I just don’t think I’m ready for it. Again… thinking of you today. If you decide last minute now is not the time to put your cat down remember you don’t have to. My Birkie was a fighter. Was in good spirits right until his last day and he passed on his own time. I just wish I would of been there right alongside him but I did get to be with him in his final hours to say goodbye. I do have to say thank you to Sarman’s owner too. This has been helping me cope some. I am crying so much after reading this. My boyfriend and I rescued little Oslo from a local shelter just a little over a month ago. The first few weeks he was super playful, exploring constantly, and even a little mischievous (Like every adorable kitten is). Last week, we took him to the vet to get his first round of vaccinations. The vet said everything looked great and that Oslo seemed in perfect heath! A few days later, things took a turn for the worse. Oslo was barely eating, sleeping all day, not playing with his favorite toys and seemed depressed. I thought maybe this was a reaction to the recent vaccination, but yesterday while Oslo was laying on me I noticed he had labored breathing and this was a huge red flag. We scheduled an appointment at the vet right away and today our worst fears were confirmed. Little Oslo has FIP (wet) and we are completely broken. It is unreal how quickly this all happened. One day, the vet says he is in perfect health. 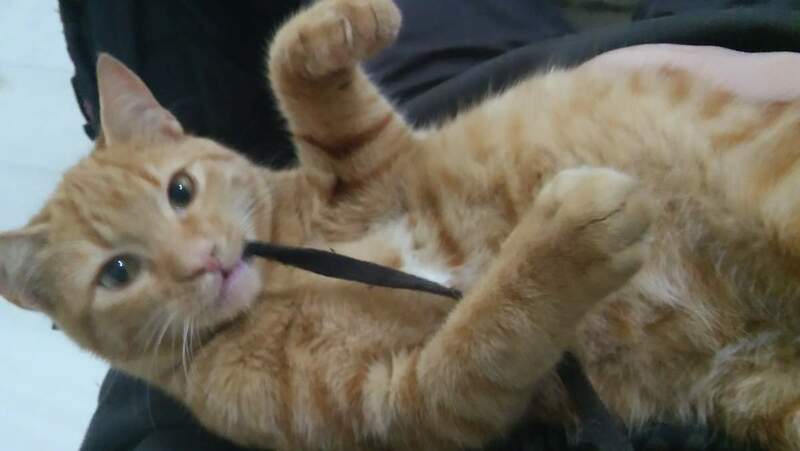 He’s playing and running around like a kitten should, and the next, not even eating or playing at all. I had never heard of FIP before today, and there is not much information about it online. I thank you for sharing your story and I will cherish our last days with our little Oslo making him as comfortable as possible.. Believe me, I am also crying after reading your comment. So sorry. I am sure he knows how much you love him. Our Chloé past away on Saturday, suspected FIP, only 7 months old. Much of my friends consider me a strong woman, I’ve never been depressed in my 59 years, I cried over my pets who passed away over the years, but I’ve never experienced a grief like this one in my whole life. Friends tell me with time etc. I’m not sure at all. First I read your article, then I wrote my response but it was only after that I read the comments of other people. I am writing the next while it might be useful for cat owners dealing with the same problem. Although the treatment for hear sneezing helped her she never really had a normal breathing, when I took her in my arms I could just feel her breathing, wich is not normal. On the day she passed away I noticed she had a very yellow nose (liver failure?) and was perhaps drinking more than usual. Another, strange? thing, she wasn’t sick at the point to say that she would pass away, in those 2 weeks she had days she was almost perfectly fine (which gives you hope) and shred your hope to pieces in 48 hours. Just a little time before she went, I had the pavement of the room were the litter is, in one immens pool of blood. By reading your article and comments I feel a little less alone, it helps a lot! I agree that this article made me feel a little less alone and I can’t thank Sarman’s owner enough for posting this. What a brave person to document this so well. I truly hope that all of us cat lovers who suffered with watching our cat die of this horrible disease never have to deal with this FIP again. It truly is the worst thing ever. I felt like I was living a horror story. To this day I’m still suffering from nightmares of it all. Thank you for your comment, Janine. I am really sorry for Chloé, and for you. At least, you loved her and she knew that for sure. Most animals die without knowing what being loved feels like. Oh oh, I don’t know about your last sentence… But thank you for your kind reply! Thank you very much for sharing your story. It really touched my heart as you know exactly what it means and how it feels. My cat Guri is 11.5. He is red and white, the most beautiful and the most gentle among our three cats. He was diagnosed only yesterday, but I have a feeling that the disease is progressing for the last couple of months. It looks like Guri is in his final days now, and very soon I will need to make the decision to relief him from pain. The hardest thing probably is the fact that my husband and daughter are away for the holidays, visiting our families across the ocean, and I am not sure if I can keep Guri alive until they come back. Who could imagine that five days could seem so far away in time?! So I wonder through Internet at nights with Guri by my side. Reading your story made me feel less lonely. Thank you again. Hopefully, the New Year will bring only good news. Anna. I wish you all the strength you can get! I know how hard it is, for me Chloé was only with us for a short time, but it hurts like hell. I don’t think it matters how long they stayed our companions, the grief will be the same. Thank you for your love Jeanine. Guri sends his love from the rainbow. He and Chloé must be feeling much better now without all the pain. We are still reeling from the loss of our cat Genie, a sweet Tortie, to FIP. She was “put to sleep” on December 7, 2018 at 7:45PM. She was 5 years old. My neighbor adopted her from a local shelter. all her siblings had died and she was sick when he came to live with him. I work from home and he was always gone, so I ended up taking care of her and she stayed with me while he was at work. eventually he moved away (we own the house and he rented it from us). the new place didn’t accept cats so he dumped her at a farm. We were devasated that he had done that to her. After a couple of weeks, we found her on our rental house’ roof. We took her in and she stole our hearts. The sweetest cat we have ever known. She was so smart and she loved to be held and talked to. she would rub her nose with mine. On October 29, 2018 I noticed she seemed sad and depressed. I had noticed that she wasn’t eating much for the last three weeks or so. she was eating but wasn’t eating her treats that she begged for all the time. I took her to our Vet and he did several tests and discoved Fatty Liver and an infection. we put her on antibiotics, an appetite stimulator and advised us to force feed her. She didn’t respond so her admitted her to the hospital for fluids and force feeding for 4 days. when we went to pick her up he told us to give her a week and if no improvement, to have her euthanized. He gave her a B12 shot and filled her neck with fluids before we took her home. She perked up and would eat if we coached her. We decided to give her more time since her fever was gone and her weight didn’t go down further. we left for Florida on December 1st. Once we arrived, she stopped eating again. i took her to a vet and he said she needed a blood transfusion immediately. he gave her B12 and fluids just as our vet had done. we took her to the small animal ER in Ocala, FL for the transfusion. after that she ate and ate and ate (according to the Dr. ) She got a bit of her personality back BUT right after the transfusion, a yellow, viscous fluid formed in her belly. they told us it was likely FIP. they recommended euthanization. We took her back to our house for a day just to have some time to process it all and spend some time with her. It happened so fast. One day she was playing and running and cuddling and the next day her personality was gone. she was so pittiful…couldn’t get a decent meow going, barely could walk. She was so young. Our hearts are broken. We decided to have her euthanized right away because otherwise she would have either starved to death or would have drowned from the fluid. It was hard but we couldn’t allow her to suffer just so we could have more time with her. I am really sorry. Very, very sad story. Euthanizing her was the right decision. I am sure it was a hard and very sad decision but it was the best for her. Mittens my cat was 9 years old when she got the wet version of FIP. She died in one week. It was the scariest and most sad experience. Seeing pictures of your cat made me cry. The weakness in his eyes is how she looked before she died. I took the web down in all the languages that I speak (that is 5 of them) the literature about FIP is quite substantial. I subscribed to 2 forums, this one and a Dutch one. I was schockend that my Chloé died so suddenly (made me even think it wasn’t FIP) because quite some owners had their FIP cats for months or even years… sadly that wasn’t your case eather, proof that some go quite quickly. Tomorrow it will be a month since she’s gone, I feel sick to my stomach, have nightmares and I have never been so sad in all my life. It is so difficult to accept and a real struggle to overcome. All my love and get all the strength you need! Hi Jeanine! Just want you to know it has been over a month since my Birkie passed (Dec 2nd). I too still feel sick… cry all the time still because I am so sad and so defeated… also have nightmares (and my doctor doesn’t get this!). This pain of experiencing FIP, if I ever have another cat with it will scar me for life on ever wanting another cat again. I’m so panic stricken and suffer from anxiety because of it. I tried to foster to adopt another kitten only to return him because of fear. My vet even said its clear I have a lot of anxiety. I baby our other cat now (Birkie’s adopted brother). I can’t even stay focused on trying to start my new business until all this anxiety passes. My doctor put me on two different medications to try to calm my anxiety but it just makes it worse. Crazy… I never thought in a million years I would have to see a Dr. for my pet passing but FIP is a horrible vicious disease/virus! If humans could get it, I wouldn’t wish it upon my worst enemy. Hugs. You See, were I live it’s 5 o’clock in the morning and I woke up 3 hours ago. I believe I know pretty well what you are going through. I got lots of support on the Dutch forum, not all lost a pet because of FIP and not all lost a cat but dogs as well. Some were young others old but everyone was going through the same process of grieving and suffering. Some people still feel the pain years later but all agree that, eventually, it gets better. My vet told me that if I still suffer too much a month later I should go and see my GP, but I think I prefer to wait cause I’m not to keen on medication. I’ve read 2 books on how to cope with grief, it helps a little. Writing it off can give some relief as well. I have a dog and try to walk as much as I can, 2 hours in the morning and 2 hours in the afternoon, this works for me, but although I am pretty tired afterwards I still can’t sleep normally. My friends are not really helping, they think I should of have been over it by now and go on with my life. Therefore I avoid talking about it and prefer writing to other people, like you. I wish you all the best and hugs to you as well. I’ve sent you an email, check perhaps your spam or unwanted mail since mine is for free and easily goes in there. I’ve also never thought it would affect me so much, I love all my pets but I have to admit I loved Chloé more… she was certainly different, maybe I loved her more because she was smaller and fragile… I thought and hoped when I took her in at about 3/4 weeks old, I, well the vet more, would have been able to save her and take care for her for the rest of our lives. Now I feel just empty. I deceived her and I feel so guilty. 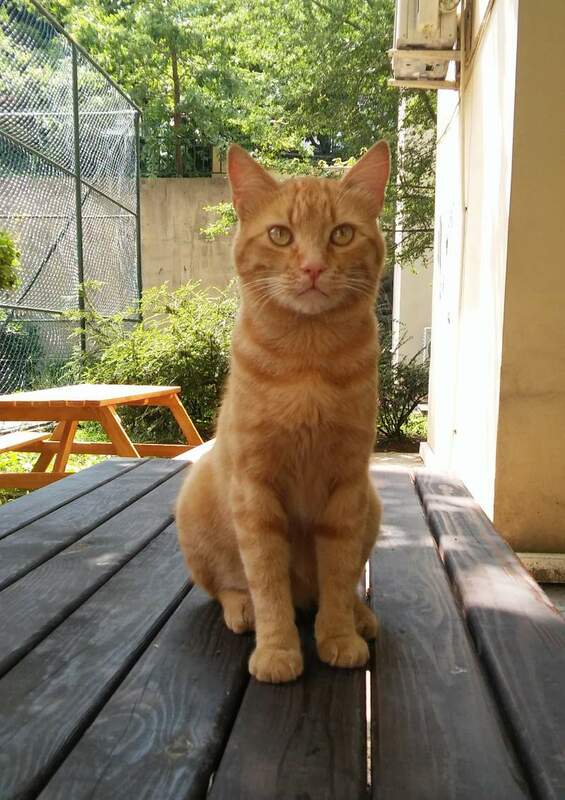 I consulted a second vet, for a second opinion, it was him who mentioned FIP right away and then I felt so much anger towards the first vet, and myself for not have consulted the second one earlier, for not have consulted a third vet… but I also have to remain objective, I wouldn’t have had the time to consult a third vet because it all went so incredibly fast. It really hurts, I still see and hear her all the time, I’m constantly looking at pictures and small videos although these make me cry (like all the time) when I’m lying in bed I call her name constantly and many more “strange” things I’ve never done before. I also had physical pain (like the flu) and did not manage to function properly (doing the basic housework, so to say) Could not concentrate, dangerous when you drive your car. It’s only since a couple of days I manage to manage myself a bit better, that’s, I manage to go into a shop or mall without having to run out of it in tears. I stopped hating my neighbors cats, they are 10 of them, all ugly ones but in great health (none are vaccinated) that’s why I started to hate them. Thank you for sharing your story. I adopted Max from a local shelter in mid-December. A month later, i noticed his belly was enlarged and, thinking he might have a bowel obstruction, took him to the emergency vet. They diagnosed him with the wet form of FIP. He has been on Predisalone and Clavamox but his belly is so big. We’re going to the vet tomorrow to assess. Max is so gentle and so affectionate. It grieves me that he’s hardly had a kitten-hood. At least he’s being loved and cared for, but my heart is just breaking. For all of us, humans and kitties, i wish for healing… and a new drug to treat this horrible disease. Really sorry to hear that, Leanne. Me too, I hope some kind of drug will be available as soon as possible. Today is exactly 2 months my Chloé past away… It is really hard, I am still heartbroken and struggling all the time. Despite my heartache I do not feel sorry for myself but I do for Chloé, she was just an adorable kitten, full of life, joy and love. It’s a shame some of our furries have to endure this incurable disease. I wish you lots of love and strength! Wow. There is so much personal experience information here. Which is what I was looking for. I’m waiting on my vet to call me Tuesday with results for my sweet rescue cat Mykey. He just hasn’t been eating and looks a bit skinnier. He had raised antibodies in his blood. Protein in his urine too. I’m praying so hard right now that it’s something else that isn’t life threatening. He just turned 4 on January 1st. 🖤 Thank you for this post. I hope he isn’t FIP and become healthy again, Dana. Mykey tested negative! Whew. Thank you though for this post. I really appreciate it still. That’s great, Dana! How’s he now? I hope he’s Ok! Hi everyone.just 4 days ago my baby Kyra was euthanized. I noticed the big stomach just a few weeks ago but I thought she was finally enjoying food and to eat. Kyra was special, she was a stray cat, born without eyelids, lashes sticked to her eyes and caused ulcers, 2 cirguries were made and finally cryosurgery. She also had a heart murmur, thats why she didn’t do much activity, she was always skinny, it took me 2 years to make her feel comfortable with humans, it took me alot to win her trust as I had to give her 3 meds everyday, but she was fine since she was 4yrs, her eyes were fine, like she opened herself to the world, to life, she didn’t hide anymore, she demanded water, food, she wasn’t afraid no more of her siblings (2 cats, 3 dogs) she played and like being around me and to be pet but still as being the youngest of all my pets she was my baby, she was fragile, she need to be protected more than the other ones, she was more weak than them. Then I noticed the anormal breathing, I though maybe it was her heart, and also ulcers returned to her eyes, took me 4 days to get her to the vet, she stopped eating, another vet did xray, results pleural effusion, all white, in and out of lungs and abdomen, all filled with liquid. After vet took sample she was diagnosticated with fip. Vet said she would probably die of the anesthesia if he tried to drain the fluid and that there will be no use for that as fluid will come back in a few days. I stayed with her the whole day, put relaxing music.i returned to the vet next day, no more need for her to feel pain in her life. I used to think that i have saved her from pain and showed her about love and happiness in life but then this sickness fip came in and took everything she had earned in life. And also took my little baby, why her I cried, if only I had the chance to spent more days with her, to show her more of the world. It’s so unfair. Why life had to be so hard for her, why couldn’t I save her. It feels like I can’t accept the fact she is no longer here, like a bad dream I want to wake up, I don’t think the pain nor the tears will go away.. I totally understand you, Verónica. I know how it hurts. I think you saved her. She’d already die if you didn’t adopt her. You loved her. She knew what being loved is. You did your best. Life is cruel. Yes we should be able to share our silly stories and yet we are here to share the horror of this disease. I wish both of you lots of strength and support. Do allow yourselves to grieve and take the time to do so. I wanted to share the following. I had to call the vet, I still had many doubts.I asked her how could kyra had become infected if she was an indoor cat and she told me that it could have been a natural infection (from birth) but that they still don’t know everything about this disease, I asked her if we could have tried to drain and she told me that the fluid was inside and on the outside that my kyra was already in the final phase, I asked her if I could have avoided fip if I had given her better quality food and she told me that although the food is important that it would not have ensured that she did not get sick, I asked her if there had been posibility that I saved her and she told me that in the state she was she calculated 3 days of life, I asked her if I had made the best decision and she told me that if it had been her kitten she would have done the same, that the disease is very fast and that all this incredible and so hard to assimilate and told me that she knew I loved her and that there was nothing else we could have done. I have dreams too, I see Kyra in my dreams, i really really want to smell her again, I was sick the last of her days and I couldn’t smell her, that’s driving me mad, I tried to find the hairs in the sofa but it’s impossible they mix with my other pets hairs. I won’t be able to smell her again. I just have the videos, the photos, the memories. I really wish to have more time with her. Yes I’m angry to life, for making this sweet little baby to had so many pain in her life, her first 2 years and her last days. As you say I promised her to keep her safe and I failed. I’m so grateful for your blog and the additional comments. I never knew anything about FIP until a week ago. Now I know more than I ever wanted to. My daughter’s precious 9 month old kitten passed this week. We are totally devastated. It’s comforting to read everyones comments & sadly very similar situation. (a rapid sudden decline) It’s been a heartbreaking week. Our kitty Tweak brought so much needed joy to our lives. He was so loving, snuggly, playful & so much fun. He became my daughter’s much needed companion BFF during a very hard time in her life. A hard time brought on from other life losses & grieving. I am trying to grasp how this has all happened. Life is so cruel and unfair. How can our kitten be gone? He was everything to my daughter who just needs her kitten to hold. Really sorry to hear that, Liz. I know how you and your daughter feel. One and a half year passed since I lost my beloved Sarman and it still hurts. I don’t know what to say. As you said, life is so cruel and unfair. It’s now a Friday, 4:00 am In San Diego. Lost Ms. Purdy at 10:30 on Tuesday, from some “crazy virus” that took her life in a matter of 8 days. Tomorrow we get the results of her Naprocy. I’ve never reached out to anyone about anything but for her I will. Thanks for allowing me to read your stories. I’m really sorry for all of us.Its been 16 days since Khyra is gone and everytime I open a door in my house I still don’t know how but hope to see her, in her favourite places, so I imagine her. I think she is still with me.. well in my mind. It still hurts. Really sorry about Khyra, Verónica. Believe me, I can understand your feelings. How everything suddenly starts looking empty and meaningless. Thanks for the message, Nannie. So sorry about your cat. I hope he’ll survive. Believe me, I know how do you feel. Lots of love. My Birkie was 7 years old…he too used his litter box…purred…slept with me…played…acted like he was normal except one thing…he wasnt eating. Besides the fact that their belly might have fluid built up to make them not hungry, what i have also found out is that their teeth hurt so bad that they don’t want to eat. Experimental drugs may help…but the odds are stacked up against them for the most part. Its very sad…there’s not enough words to comfort u during this time. Just know all of us have experienced what u r going through. Hugs. THERE IS HOPE!! Hi everyone. So sorry that you went through what I did. The vet misdiagnosed my (very very) loved cat Zoe, it was adult FIP, not cancer. She survived it as a kitten but the vets didn’t even consider that it was FIP when it resurfaced and 12 years ago when she was a kitten no-one used the term FIP so i didn’t know what it was that she survived. PLEASE READ THIS – ** HESPERIDIN ** CAN SAVE YOUR CAT!!! I have a kitten now who survived wet FIP, he can’t have biscuits and still tends towards inflammation even on very limited commercial kitten sachet food and mostly raw and cooked protein. Seems best on raw foods. But he still needs HESPERIDIN daily to stay healthy, happy, playful and to keep away the wheezes. Buy online or some pharmacies / health shops sell it. Email any time, maddiroberts@gmail.com. Hesperidin is just a bioflavonoid like Vit C, it is a poweful anti-inflammatory and natural steroid. I take a capsule and mix it with coconut oil and you can add chlorella, taurine, cat multi-vitamin or whatever you want, smear in side of mouth once daily, about 1/10th of a capsule. It is also doing wonders for my old boy cat with kidney disease. Anything inflammatory – give Hesperidin. Can’t do any harm. Thanks for the comment, Maddi. A warning to readers: always take that kind of suggestions with a pinch of salt and always consult to your vet before trying anything new. Hesperidin is a common antioxidant found in citrus fruits (lemon, orange, etc). The proof is in the pudding I have photos of my kitten happy and healthy due to Hesperidin. Vets don’t offer any hope as you are aware and they are not Naturopaths but I am. Good luck.